I now have dates and prices for our three trips for this year. Book soon as there are only 50 seats for each trip. Our first one, Dear Evan Hansen, an award winning Broadway show, is on May 25 and costs $203 and includes a meal at the Hot House Restaurant. The show Brigadoon at the Shaw Festival in Niagara on the Lake is on September 24 with free time to explore this lovely area with lunch on your own. Price is $120. 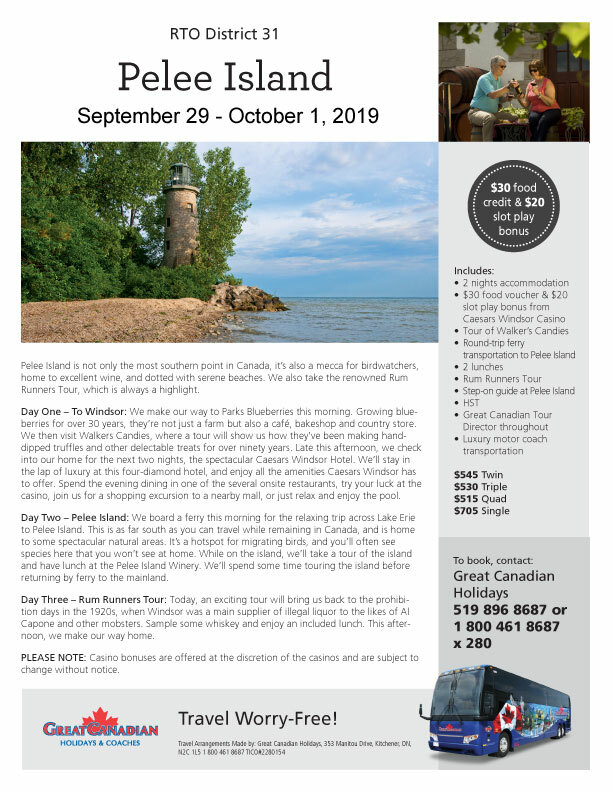 The Pelee Island Tour is Oct. 1--3 and begins at $545 double. Also includes Rum Runners Tour, Parks Blueberries, Walkers Candies and a 2 night stay at Caesars Windsor. For day tours, book with me at lynnmorrison@wightman.ca or 519-323-2419 or after mid February 813-780-8083. For the Pelee Island Trip, book with Great Canadian at 1-800-461-8687. To download a more readable version of this brochure, click on the image.